At the height of the transport strike yesterday afternoon, workers in the Cavite ecozone held a protest against the management schemes of busting unions by shutting down factories. One garments factory temporarily shutdown last month and there are rumors of an electronics firm closing next month, both located at the Cavite Economic Zone in the town of Rosario. Workers are alleging that the shutdowns are motivated by union busting. 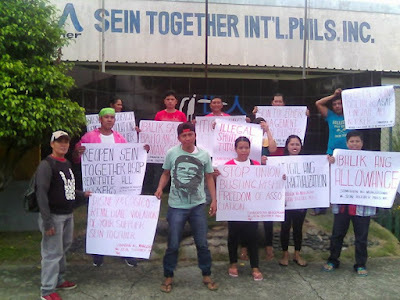 Workers of the garments factory Sein Together Phils. Inc., which shutdown last month, led the mass action where respect for freedom of association, and better wages and benefits were demanded. Almost four hundred Sein Together workers were terminated after accepting a separation offer. Meanwhile at the electronics firm Lakepower Converter Inc., overtime was cancelled and the workweek was reduced to only five days starting last week.